Kumbh Mela is scheduled January 15 to March 31, 2019, in Prayagraj, Uttar Pradesh. It is one of the mega religious events in India, where crores of people from different parts of the world travel all the way to take a holy dip into the Ganges during the auspicious days. Kumbh is a sign of peace amongst all living beings. The Kumbh Mela has been declared as the “Intangible Cultural Heritage of Humanity” by UNESCO in the year 2017. Therefore it is a world-renowned festival and encapsulates the knowledge of astronomy, astrology, religious studies, traditions, customs and practices. Kumbh can also be termed as the largest peaceful congregation of humankind, with people from all across the world becoming a part of this 6 weeks long event. The Divya and Bhavya Kumbh have been scheduled within these days i.e. January 15 to March 31, 2019. This year we shall witness an amalgamation of the grand traditions of Kumbh and modern techniques and solutions so that the visitors can have a peaceful and safe experience. A number of cultural activities have been planned by the UP Government for the development of the Indian culture and Traditions amongst the large audience. 360-degree virtual reality occurrence at Kumbh 2019- The Kumbh Mela shall have 10 stalls where the pilgrims can enjoy the experience of 360-degree virtual reality world. At these stalls, pilgrims can look at the Kumbh 2019 videos and feel as if they are physically a part of those events, with the use of a special VR headset. These stalls will display videos of main events like Peshwai (The Grand demonstration of Akhadas), bathing days (snaan), Ganga aarti etc. Also, the people across the globe can watch the events of Kumbh straight from Prayagraj using their mobile phones on the official website or the YouTube channel of the Kumbh 2019. Also, a VR Devotee app has been developed for the people to watch the LIVE and recorded videos of the mega event. Kalagram- Kalagram is the creative hub for all the visitors, showcasing Indian art and designs by locals and villagers. It will be situated in sector 19, Arail of Prayagraj, Kalagram . 13 different pavilions are formed, each having different designs and look. There will be 15 shops in every pavilion which will be open for the visitors and they can shop fine-looking craft items specially handcrafted by the Indian artisans. Kalagram shall be open from 10th January 2019 till 4th March 2019 during Kumbh Mela. Peshwai (Praveshai)- Peshwai is the grand procession organized to mark the commencement of the Kumbh Mela. It is a way of welcoming people from all over the world. You shall witness saints along with their groups on horses, elephants and hue carriages along with bands. Cultural events- The Kumbh Mela 2019 shall showcase 5 cultural Pandals, displaying cultural events. These will include musical performances, traditional and folk dances from January 2019 onwards. Ganga Pandal will be the grand pandal among all the other pandals and shall host all the major events. Pravachan Pandal and 4 convention centres equipped with state-of-the-art facilities will be created to host various spiritual events. That is not all more than 600 performances by more than 2000 artists shall occur over these days at different locations. It will be a sight to enjoy and also to regain insight of the Indian culture and traditions. Tourist Walks- The UP Government has introduced Tourist Walks and new routes for the people visiting Prayagraj. Waterways- Tourists can also experience joy rides at the Sujawan Ghat, Old Naini Bridge, Saraswati ghat and Quila ghat. These are one of the most ancient river routes of the country. Fixed-rate ticketing counter is accessible on all the ghats from where one can get an electronic ticket. Also, there is an evening cultural program scheduled daily, followed by dinner on CL Kasturba (Semi Cruise). Here traditional performances will be organized amidst the river to end upon dinner. 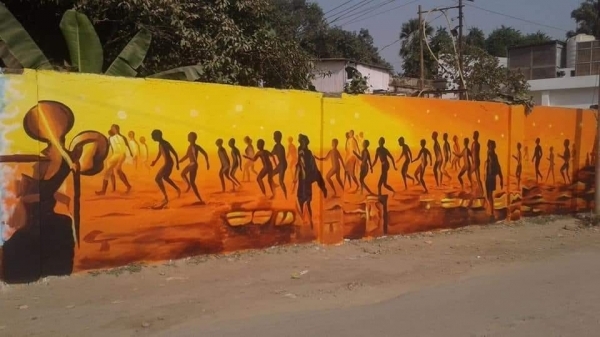 Street Art- The Kumbh Mela will be beautified by street art that will leave you in awe of the amazing scriptures being painted on the walls around the town. The streets and walls of Prayagraj have become a canvas for artists. The walls have been painted with different themes and concepts. An area of 20 lakh sq.ft, has been chosen for the street art project under the ‘Paint my city’ initiative by Kumbh Mela Authority. The initiative is supported by the Prayagraj Mela Pradhikaran of the UP government to revamp the city before Kumbh 2019 commences. Paintings include famous Indian personalities along with the paintings of Gods and Goddesses. The uniqueness of these street paintings is that the architectural essentials of the given space are in sync with the picture. This campaign will be a rejuvenating one and shall inspire all those who come for Kumbh Mela 2019. The project highlights the cultural diversity of Uttar Pradesh and Prayagraj and the spiritual, religious and scientific association of the Kumbh.